Do You Know What Shape Your Videotapes Are In? The fact is your tapes are old. They're wasting away. They've been sitting in a drawer or resting on a shelf for years while you went on about your life. Now is the time to rescue them and transfer their precious images to an archival format. Don't wait until it's too late. Here's our process and what we can do to help. First, we have been in this business for a long, long time. We understand tape and tape transfer technology. Our founder, Robert Hanley actually started out shooting and editing both film and tape in the 1970's and 1980's. You might say it's in our blood. We know what to do but more than that we have a passion for preserving your memories. It's not just our job, it's our life. Home Video Studio has always been committed to keeping ahead of the curve in video technology. 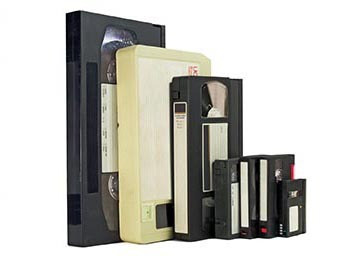 In the late 1990's we led the way in the transfer of VHS, VHS-C, 8mm and Mini-DV tapes to DVD. We pioneered the development of HVS DVD Deluxe transfer technology and years later we're still leading the way by providing the exclusive cloud-based Digital Video Archive (DVA). But it's not just the technology - it's our people. You don't stay in the business this long without tremendous dedication and a great service staff. 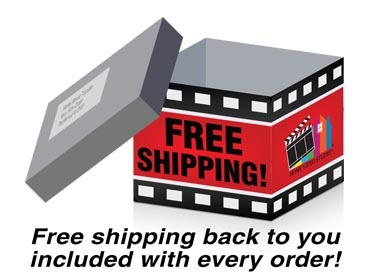 Once your videotapes arrive at our transfer center in Indianapolis, you can rest assured we will handle them with tender loving care every step of the way – just like they were our very own. Once Captured & Transferred We'll Transfer to DVA or DVD! We provide two options for viewing, sharing and archival preservation once your tapes are captured. You can choose DVA or DVD or both! An attractive imprint on the outside of the DVD. Smart Chapter Markers are placed throughout your video so you can easily skip through your finished DVD. Thumbnail scene selection. Each chapter will be indicated on an on-screen menu with a thumbnail image of the scene. This DVD is the very best in archival technology - scratch proof, hard-coated and guaranteed to last at least twenty-five years! Watch on your Computer, Smartphone, Tablet & Smart TV! DVA - Digital Video Archive: While your DVD will last for twenty-five years your DVD player will not. Plus, you may already own devices that will not play a DVD (like your brand new Apple computer), your IPad, IPhone, Android tablet, smartphone, etc. Many of our customers are selecting the DVA (Digital Video Archive) option instead of the traditional DVD. Plus you won't need any copies and you won't ever have to worry about the safety and security of your videos and memories! The DVA is rapidly replacing the DVD as the media of choice. A DVA (Digital Video Archive) is a specially designed and engineered MP4 file format containing unique customizable metadata - title information, chapter markers, thumbnail images and more which enables playback on a DVA player (computer, smartphone, tablet and smart TV- with internet access). DVAs are easily viewed, modified, edited, shared and archivally stored in the cloud at DigitalVideoArchive.com. A DVA can be shared with one person, several family members or your entire circle of friends and family. Here's more information about this new and exciting product and service.